Have you ever seen a tile and you knew it was the one? That is EXACTLY what my mother-in-law and I thought when we set our eyes on this amazing, incredible, color-perfect Tundra Gray tile. It had a story and a journey, just waiting to be written. I loved it so much, I designed an entire bathroom around it. 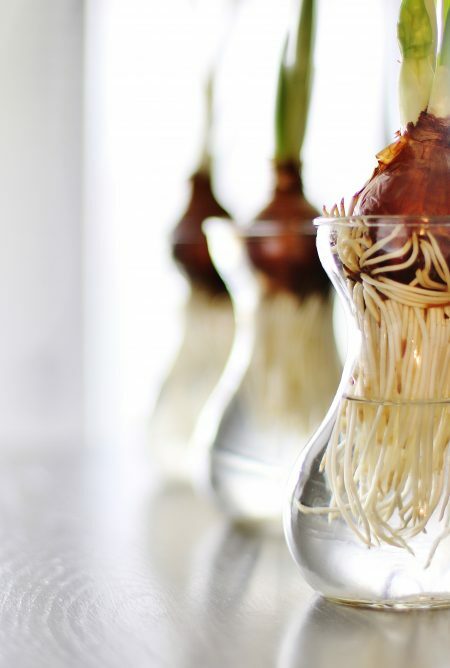 Are you ready for a little before and after? 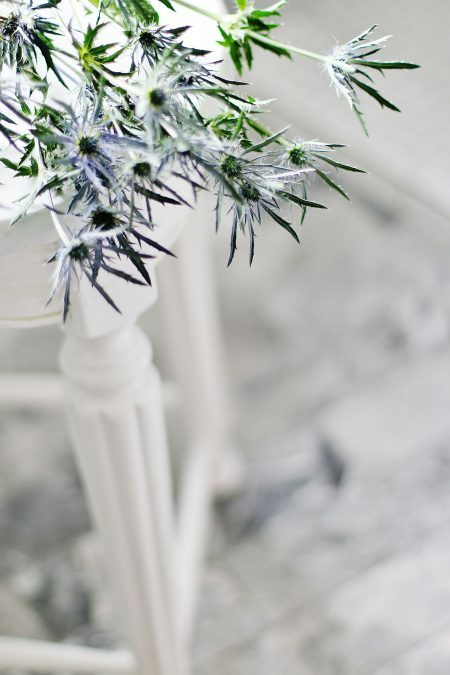 Are you ready for a space that has been painted and re-tiled and re-designed? Are you ready for a bathroom that is living its best life? The existing space had plenty of challenges. There was a soaker tub that needed to be framed out. The shower was too small. The room felt small because the ceiling was dark and the entire space needed to be lightened and brightened. 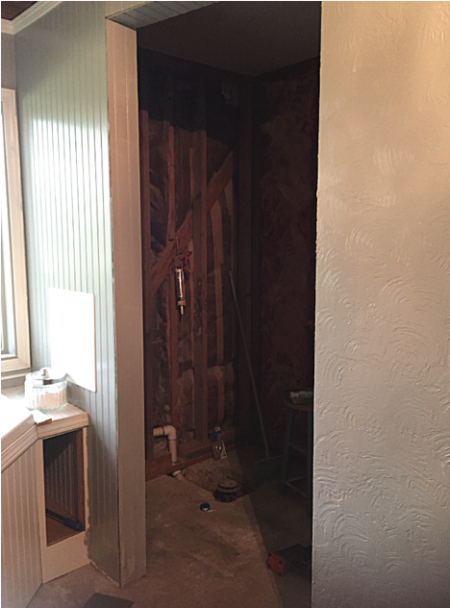 The existing shower wall was knocked down and re-framed with new drywall and a new opening to create a much larger space for the shower. 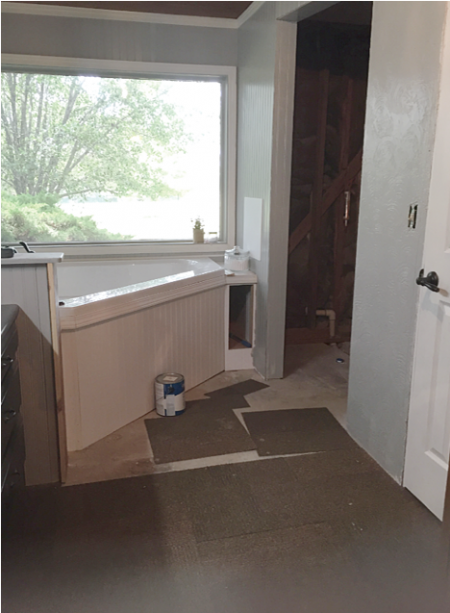 The soaker tub was framed in with new beadboard and molding and a step was built for easier access. Here’s a closer look at the shower wall that was framed out. A small cabinet was built to connect the soaker tub to the wall. Everything was framed out and caulked and tiled and painted with new molding and new flooring. The space looks like this. What a difference a little makeover can bring to a space. And the star of the show? On the floor, each tile piece is 3”x 12”. 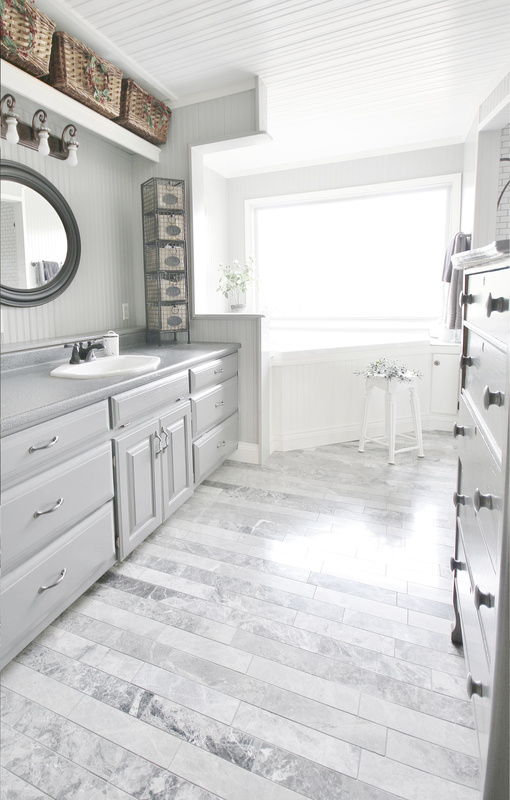 It’s the Tundra Gray Marble tile laid in a brick pattern. The shower is so much larger and more functional. 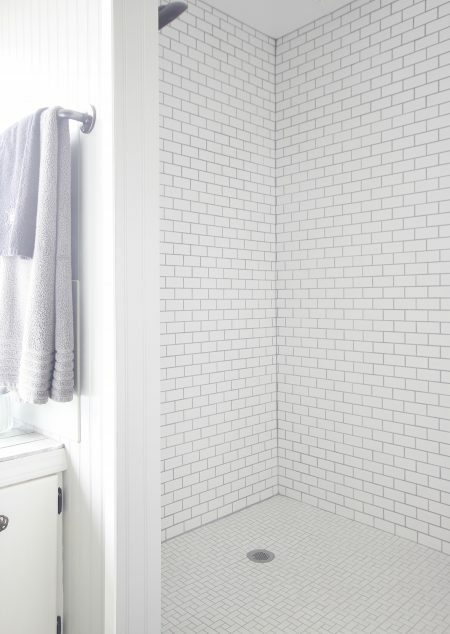 After the shower was framed out, it was tiled with a classic White Brick subway tile on the wall and a Windmill White Porcelain Mosaic Tile on the floor. I love the combination of the two tile patterns. It feels timeless and classic and yet fresh at the same time. Here’s a close-up of the shower tile so you can see the patterns better. 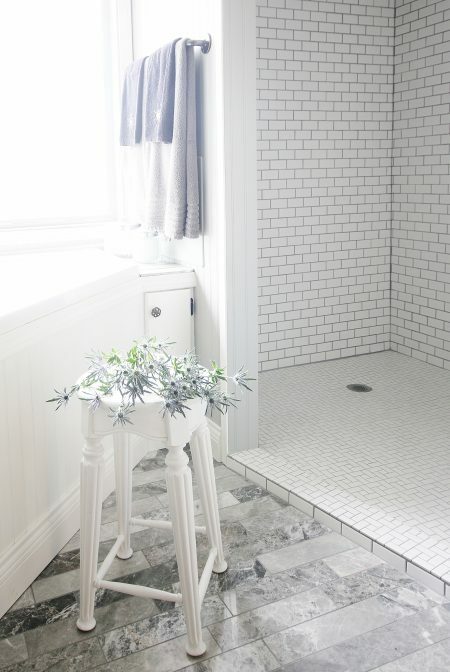 We used darker gray grout in the shower to make the tile pattern pop. 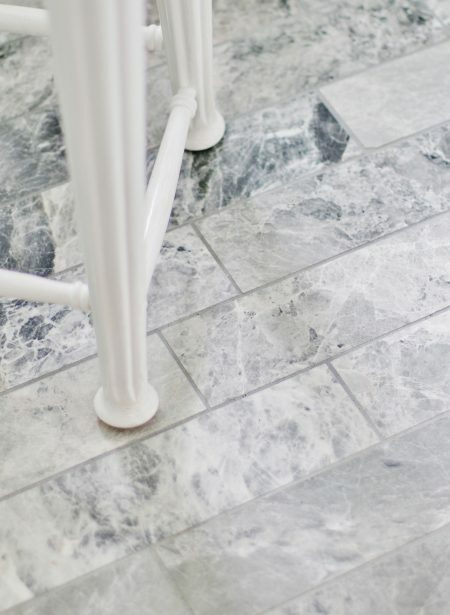 On the floor tile, we used a lighter gray so the marble texture and pattern could shine. 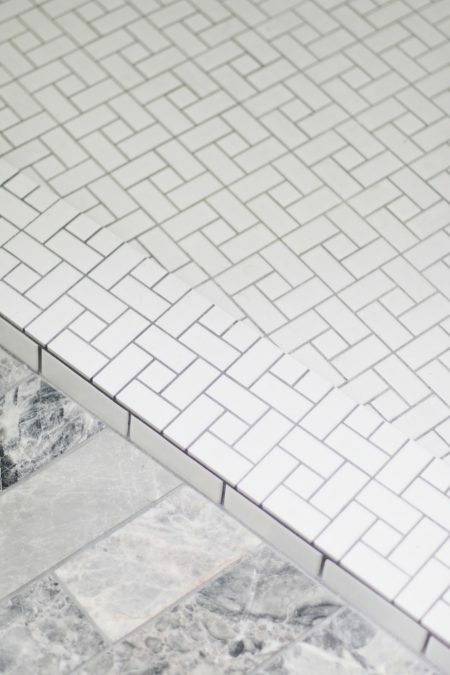 Where the two tiles meet, we added a small border of subway tile. The cabinets were painted a darker gray. The walls were painted a light gray and the ceilings and moldings were painted bright white. The new color scheme makes the bathroom appear so much bigger. 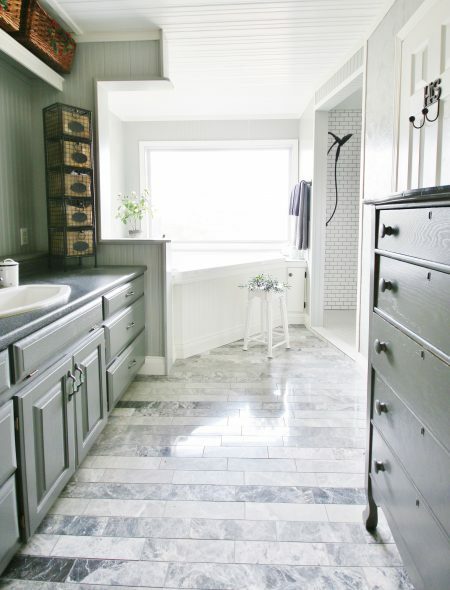 Both of the paint colors were inspired by the floor tile. We also used some of the floor tile to add a small countertop next to the bath. The molding was painted white to match the other molding in the room. It’s the perfect place for storage and to keep all the bath essentials within easy reach. My mother-in-law and father-in-law are so happy with the finished bathroom. It’s now a lighter and brighter space. And it all started with a tile. Create a space that inspires you and write your tile’s story today. What color paint did you use on the walls and cabinets as I am getting ready for a redo in my master bath too!!! Thank you.